All of us are happy to find a product that makes life easier without forcing a compromise on quality. 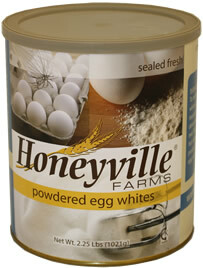 Honeyville's Powdered Egg Whites have been used commercially for years, but are now available for convenient home use. This versatile product now makes life easier for the baker at home, without compromising the quality of your finished bakery products. Powdered egg whites have several advantages over fresh eggs. One 2.25 pound can of Powdered Egg Whites contains the equivalent of 255 Large Fresh Egg Whites. The difficulty in separating the yolk from the clear is eliminated. In recipes that call for egg whites, there is no waste in egg yolks. No more waiting for egg whites to come to room temperature. Eliminating waste and saving time are only a few of the advantage in using our product. The use of only the highest-grade eggs, and the pasteurization process removes any possibility of salmonella contamination. Because powdered egg whites do not need to be refrigerated after opening, they conserve energy and shelf space. If you are searching for ways to reduce fat and cholesterol in dishes traditionally calling for whole eggs, powdered egg whites make a healthy substitute. Each # 10 Can of Dehydrated Eggs contains 2.25 pounds of product. A #10 can measures 7 inches tall and is a little over 6 inches in diameter, or roughly the size of a large coffee can. Buy Powdered Egg Whites in the Los Angeles, California area. Buy powdered egg whites in the Salt Lake City, Utah area and in Southern California region. Powdered Egg Whites are inexpensive to ship and 2nd and 3rd cans can be added at no additional shipping charge for orders shipped in the continental United States. Stock up on Egg Whites and save.